Danny Fredrickson from Lakeville (MN) was presented with his fifth guitar trophy as winner of the Thunderstruck93 memorial race at Elko Speedway in honor of Dan Ryan and benefiting the "a race worth winning" organization that supports families in their fight with A.L.S. Under cloudy skies and rain looking imminent the ARCA Midwest Tour race was shortened to 93 laps before it began. 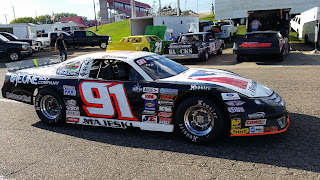 Midwest tour point leader and two time defending Champion Ty Majeski #91 broke a rear end in his primary car during practice and had to switch to a back up car, he still was the fast qualifier with a time of 13.736, and started the race 13th. Rookie Super Late Model driver Chris Marek #3 started from the pole position, fought back former Midwest tour Champion #77 Jonathan Eilen and then led the first twenty laps. Danny Fredrickson #36 is a three time Midwest tour Champion himself and also an Elko Speedway Champion in 2003. 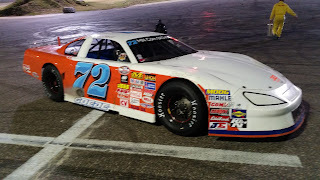 Fredrickson started the race 7th and quickly moved to the front of the field, he grabbed the lead at lap twenty and took off as Majeski and three time Elko Speedway Champ #72 Jacob Goede were making their way through this star studded field of Super Late Models. On lap sixty Fredrickson had a big lead and Majeski had made his way up to second place. Then with twenty to go Fredrickson caught some faster cars at the tail end of the lead lap and Majeski was right on his back bumper. These two titans fought it out until the end with Fredrickson finishing just ahead of Majeski, the margin of victory was only .182 seconds with Goede finishing third. The TOP 3 Podium was the same three drivers as last year, only this year Fredrickson came out on top. It was the fifth win of the eight Thunderstruck93 events for Fredrickson who celebrated with the Ryan Family in Elko victory lane. Fourteen of the 27 cars finished on the lead lap. 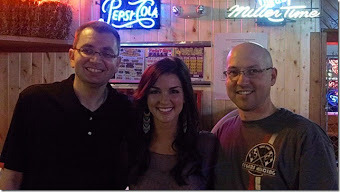 Only three drivers have competed in all 8 Thunderstruck events, they are Fredrickson, Nick Murgic and Joel Theisen. The Big 8 Late Model Series ran a 58 lap race during Thunderstruck93 and it was an epic battle between #2 Michael Bilderback from South Beloit (IL) and Michael Ostdiek from Lakeville (MN). J Herbst #82 a former La Crosse Speedway Champion from West Salem (WI) actually had the field covered the first half of the race before mechanical problems dropped him from the top spot on lap 34. That's when former Big 8 series Champion and Rockford (IL) Speedway Champion #2 Bilderback took the lead, he was closely followed by #18 Michael Ostdiek who has had an incredible season at Elko, winning four features and finishing third in the National NASCAR Whelen All American Series point standings for Division II. These two raced hard and had some contact, more than once, on the final lap. It was an incredible run to the checkers with Bilderback crossing the finish line just .018 seconds ahead of Ostdiek for the win. Brent Kane #99 from Lonsdale (MN) won his second feature of 2016 on the final night of racing in the Genz-Ryan Thunder Car division. Kane jumped out front right away and never looked back. Jeremy Wolff #32 from Chaska (MN) finished second in the feature and secured his first ever Elko Speedway Championship. Conrad Jorgenson #3 was third, Eric Campbell #25 was fourth and #15 Cole Neisius finished fifth in this 18 car field. Jeremy Wolff won a Hobby Stock Championship at Raceway Park in Shakopee (MN) in 2008, this is just his third full season racing at Elko, he had finished second in points the previous two years before scoring five wins and winning the Championship this year. Wolff finished 31 points ahead of Kane in the race for the title, Eric Campbell was third in points followed by #07 Dillon Sellner in fourth and #3 Conrad Jorgenson fifth. Joey Prusak #6 from Minnetonka (MN) won the final Pepsi Power Stock main event of 2016, it was his third win of the season. Former Champion #88 Nick Oxborough finished second .457 behind Prusak, #54 Tim Hollen was a strong third with #8 Taylor Goldman finishing fourth and #62 Tom Doten from St Paul (MN) rounding out the TOP 5. 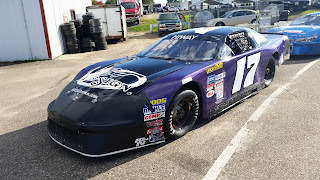 It is very appropriate that Tom Doten would score another TOP 5 finish in the last race, it is his specialty, he scored 17 TOP 5 finishes in 24 races this season, the most of any driver in the division and that helped him secure his first career Elko Speedway Championship. Rookie driver Bryce Blohm #37 from Lakeville (MN) had a great season, he scored five wins and was in the hunt for the title right up until the very end. 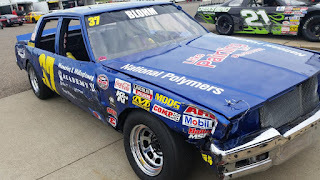 Blohm was only eight points behind Doten coming into the final feature but had some bad luck with a flat tire during the race, he finished 17th. Doten wins the Power Stock Championship by 25 points over Blohm with #7 Brandon Petersen finishing third, Taylor Goldman #8 fourth and #6 Joey Prusak fifth in points. Double features were raced at Elko Speedway during Thunderstruck93. The first 20 lap race was as close as it gets, #4 Brady Fox-Rhode from Loretto (MN) won his third feature of the year just edging #13 Tim Brockhouse by a bumper at the line with #71 Derek Lemke just a whisker behind. Cole Klein #8 finished fourth in the first feature with #16 Matt Allen wrapping up the TOP 5. In the second nineteen car feature Derek Lemke from Shakopee (MN) was the winner, it was his seventh win this year at Elko Speedway. Matt Berlin #16 from Mequon (WI) finished second with #4 Brady Fox-Rhode third, #13 Tim Brockhouse fourth and #26 Will McCully in fifth. The Great North Legends are one of the most exciting divisions at Elko Speedway with intense side by side action every race. The Great North Legends are the premier division on the last night of racing at Elko Speedway next Saturday night October 1st as they will crown a Champion. Derek Lemke has an impressive 90 point lead going into that final night, as long as he starts he will win his third consecutive Championship at Elko Speedway. Justin Schelitzche #14 from Lester Prairie (MN) won the Hornets main event. Schelitzche outran #36 Brandon Olson for his fourth win of the season at Elko. Olson finished second followed by #7 Ridge Oien who was in a close battle with #55 Brandon Plekkenpol in fourth and #36 Alex Vincent in fifth. Schelitzche now has a 27 point lead over Olson going into the final night of racing at Elko Speedway. Coming up next is the final night of racing at ELKO. Its a MN Lottery Eve of Destruction presented by Leo's South. In addition to racing in the Bando's, Hornets and Great North Legends fans will see the much anticipated Trailer Race, School Bus Figure 8 races, Burnout Contest, Justin Sayne stuntman, The Green Mamba Jet Car, Rock-n-Roll Fireworks, Spectator Drags and LIVE music from Lost Highway. Gates open at 5pm with action at 6pm. Get more information at ElkoSpeedway.com, follow Elko Speedway on social media or download the free ELKO Racing app. Elko Speedway is a NASCAR sanctioned 3/8th mile progressive banked asphalt oval race track located in Elko (MN), 30 minutes South of Downtown Minneapolis (MN) just off of I-35 and County Road 2. The Thunderstruck93 event is Saturday September 24th at Elko Speedway. This event has a long history at Elko, it's the 9th annual race in honor of Dan Ryan and in support of "a race worth winning" a nonprofit organization set up to support families who are dealing with A.L.S. 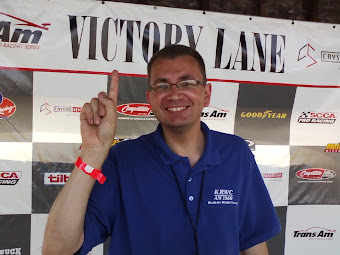 Ryan was a long time racer and car owner, he is member of the Elko Speedway Hall of Fame. Dan Ryan died of the disease in January of 2009. His car was number 93 and he loved the song Thunderstruck, hence the name Thunderstuck93. The Finale of this event is our local MN Corn Growers Super Late Models racing with the ARCA Midwest tour series. They will race a 125 lap event with a ten minute break in the action at lap 93. In the seven years of this race only four different drivers have won. Danny Fredrickson #36 from Lakeville (MN) has four wins (2010, 2011, 2012, 2014). 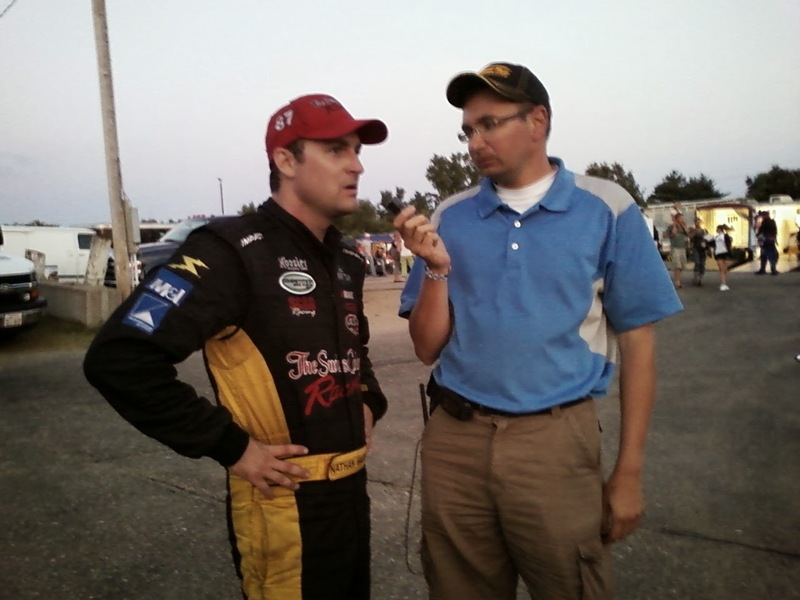 Fredrickson was the Elko Speedway Late Model Champion in 2003 who also went on to win three Championships in the Midwest Tour. Jacob Goede #72 from Carver (MN) won the inaugural event in 2009. Goede is the three time defending Super Late Model Champion at Elko Speedway. 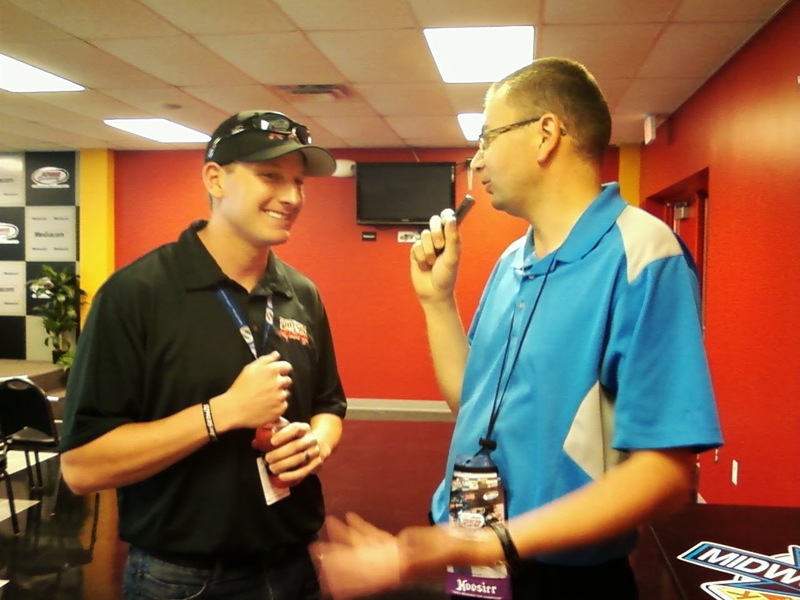 He also has won big touring series events at Iowa Speedway and Bristol Motor Speedway. Andrew Morrissey #39 from DeForest (WI) was the Midwest tour Champion in 2011 and he won the Thunderstruck93 in 2013. Ty Majeski #91 from Seymour (WI) won this race in 2015, he is the two time defending Champion of the ARCA Midwest tour, he was declared the Kulwicki Driver Development Champion last year and is currently in a developmental deal signed with Roush-Fenway racing in NASCAR. Nick Murgic from Rosemount (MN) is another driver to watch, he has competed in every Thunderstruck93 event finishing third two different times and coming in second in 2010. 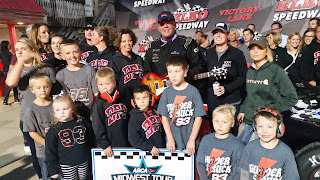 One of the most unique aspects of this race is the much desired electric guitar trophy presented to the winner by the Ryan family. This guitar was named one of the best trophies in racing by Speed51. New Thunderstruck93 logo apparel will be available for sale on raceday at the track and thanks to a donation from Country Joe Homes the full sales amount will go to help those living with ALS. One of the most spectacular finishes in Super Late Model history in the 51 years of racing at Elko Speedway happened during Thunderstruck93 in 2015. Dan Fredrickson and Jacob Goede had an intense side by side battle for the lead that seemed to go on forever, but then Ty Majeski came from the back of the pack to pass both Fredrickson and Goede during the final three laps and won by just .054 seconds. The crowd was stunned at the result and thrilled with such great racing throughout the field. In addition to the 125 lap Midwest Tour race, the Big 8 Late Model series will race with the Elko Hiway Federal Credit Union Big 8 cars. Elko Speedway has one of the strongest and largest fields of Big 8 cars in the nation. In NASCAR Whelen All American Series Div II points eight Elko Speedway drivers finished in the TOP 20 in the National Standings including National Champion hopeful #18 Michael Ostdiek from Lakeville (MN) who is second in their point standings to #2 Michael Bilderback from South Beloit (IL). 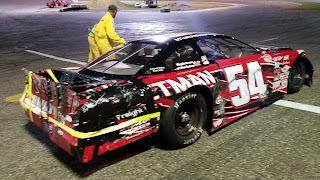 Fans also saw an incredible finish to the Big 8 Championship race at Elko Speedway last weekend, #54 Dylan Moore came back from a mid-race wreck and tied #17 Jon Lemke for the Championship with Moore winning on the tie-breaker. One of the most fan friendly parts of the Thunderstruck93 is the on-track autograph session, it will take place at 3:10pm and conclude just before action begins on the track at 4pm. Fans can meet their favorite driver, get autographs and photos on the race track. Spectator gates open at 3pm. Get more information by going to ElkoSpeedway.com or follow Elko Speedway on Social Media or download the free ELKO Racing app. Elko Speedway is a 3/8th mile progressive banked asphalt oval located in Elko (MN) 30 minutes South of Downtown Minneapolis just off of I-35 and County Road 2. The Thunderstruck93 is Saturday September 24th at Elko Speedway. The Finale of the long day of racing is the 125 Lap ARCA Midwest tour race and the exciting 58 lap Big 8 Late Model series race. Elko race fans are also eagerly awaiting two other races being held on that same night. It's Championship night in the Genz-Ryan Thunder Cars and the Pepsi Power Stocks. The Genz-Ryan Thunder Car title is up between two heated rivals. Jeremy Wolff #32 from Chaska (MN) and Brent Kane #99 from Lonsdale (MN). Jeremy Wolff has been racing since 1989, he started out on dirt racing a Hobby Stock at Arlington Raceway (MN) for four years. 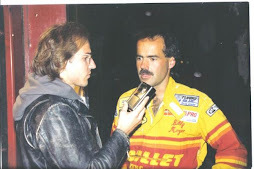 Wolff then moved to the asphalt when the Hobby Stock division began at Raceway Park in 1993. Wolff drove a Late Model for a few years from 1997-2001 and did quite well, winning races and finishing in the TOP 5 in points. 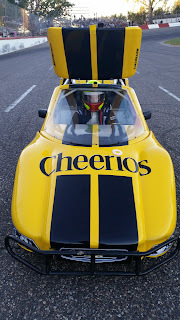 He then moved back into his familiar Hobby Stock class winning the Championship at Raceway Park in 2008. 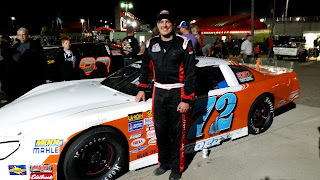 This is the third year of racing full-time at Elko Speedway, Wolff has been close to a Championship at Elko, he has finished second the previous two years. He has had an incredible season, winning five features and leading by 31 points coming into Championship night during Thunderstruck93. 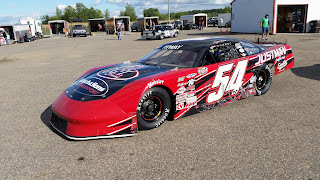 The main contender for Wolff is Brent Kane, he is known as the "King of the Thunder Cars" winning Championships at Elko Speedway in 2010, 2011, 2013 and 2015. They have similar stories, Kane also raced Late Models for a short time and then moved back to the Hobby Stock/Thunder Car division. Kane started racing full time in 1999 and won the Hobby Stock Championship at Raceway Park 3 times. He has an amazing total of 95 career feature wins. The Thunder Cars are scheduled to race both a heat and a feature event during Thunderstruck93. So the heat race is very important for points, a driver can earn 21pts for a heat race win, 18 for second, 16 for third, 14 for fourth, 12 for fifth, 10 for sixth, 8 for seventh, 7pts for eighth, 6pts for 9th, 5pts for tenth and 4pts for eleventh and 3pts for all other drivers. So, with a 31 point lead, Jeremy Wolff can wrap up the point title if he can stay within 4 points of Kane during the heat races. The last place finisher in the feature earns 24pts and the winner earns 51pts so as long as Wolff can stay 27 points ahead of Kane coming into the feature event he should win the Championship. Wolff currently has the tie-breaker which is number of wins (5 to 1). 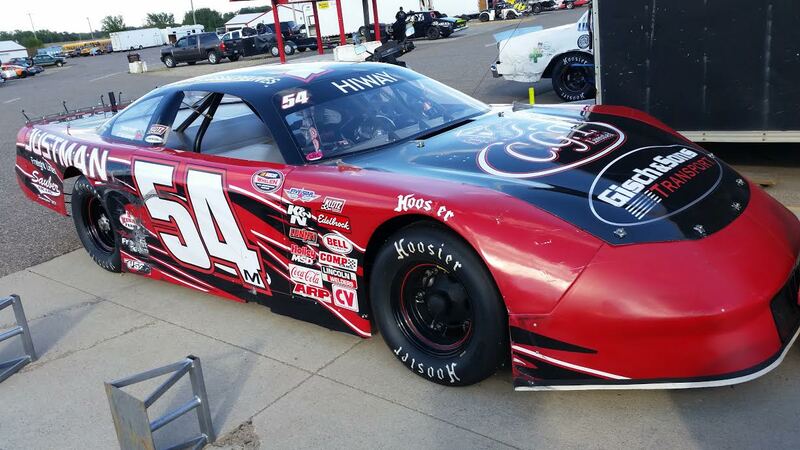 If he were to win, it would be the first career Championship for Jeremy Wolff at Elko Speedway. Both of these drivers have and large and vocal fan base and they are sure to be loud on Saturday night no matter who comes out on top. The Pepsi Power Stock Championship is sure to come down to the final race. The point leader is #62 Tom Doten a veteran driver from St Paul (MN) and second place is a rookie from Lakeville (MN) #37 Bryce Blohm. They are separated by only 6 points coming into their Championship night at Thunderstruck93. The Power Stock division has had 11 different winners this year and Bryce Blohm has garnered the most wins at 5. Tom Doten only has 1 win but has scored the most TOP 5 finishes in the division. Bryce Blohm is a rookie but he has watched his father score two Thunder Car titles at Elko Speedway (2000, 2009) and he has spent years planning for a night such as this to claim a title of his own. 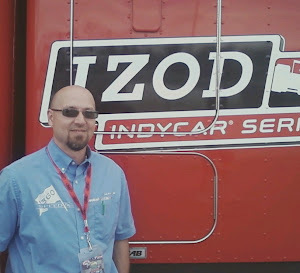 Tom Doten is on the other end of the spectrum, he has raced since about 1990 and off and on at Elko Speedway since 1995. 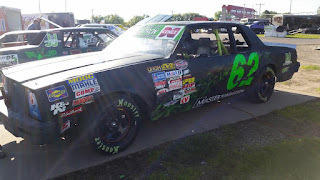 He was very close to winning the Power Stock Championship in 2013, Jon Lebens was ahead by 2 points coming into the final night of racing and then the season ended with a rain-out. Thunderstruck93 is sure to be an eventful night of racing. It all begins at 3pm with a unique on-track autograph session where you can walk the track, talk to the drivers, get autographs and photos before the action begins at 4pm. The Hornets and Great North Legends will also be racing during Thunderstruck93 and event in honor of Dan Ryan and to support families who are fighting A.L.S. Get full details by going to ElkoSpeedway.com follow Elko Speedway on Social media or by downloading the free ELKO Racing app. Elko Speedway is a NASCAR sanctioned 3/8th mile progressive banked asphlat oval racetrack in Elko (MN) located 30 minutes South of Downtown Minneapolis just off of I-35 and County road 2. Under beautiful clear skies and a full harvest moon fans witnessed real life drama rarely seen in motorsports as two drivers fought for the title in the Hiway federal credit union Big 8 division..
After a full year of racing the point standings were incredibly close with #54 Dylan Moore from Northfield (MN) leading #17 Jon Lemke by 11 points coming into the night. Jon Lemke was faster in qualifying and picked up two points so entering the first feature Moore led by only 9 points. In the first 20 lap feature Moore and Lemke started nose to tail mid-pack. 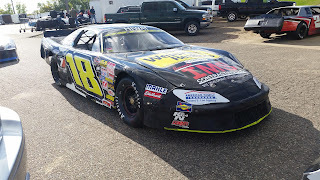 Lemke is a former two time Late Model Champion at Elko Speedway, he used his veteran skills to get past Moore and finish fourth, Moore started sixth and finished sixth in that first Big 8 main event. So after that race Moore was still leading Lemke by 5 points. Moore has raced in the Big 8 division since 2008 and has finished second in points twice, he was very motivated to win his first ever Championship. Coming into the second feature Moore again started just ahead of his rival, he was 9th and Lemke was 11th. Early in the race things seemed to be going well for Moore, he was still ahead of Lemke mid-pack. On lap 7 everything changed, there was a chain reaction accident that sent numerous cars spinning, including Moore. The result of the wreck was chilling for Moore, "with how many times we got hit after we spun, I thought for sure we were done, but my spotter told me there was air in all four tires and it moved when I put it in gear so I drove it back to the pits," said Moore. His car sustained major damage with the entire rear bumper cover hanging on by a thread and obvious suspension damage. "About half the pits had rolls of duct tape and we taped it back together and was able to get back out," said Moore. "Before I pulled back out to the racetrack my steering wheel was turned about half a turn and I asked the guys which way my wheels were turned and they said it was straight, so I knew obviously something wasn't right, but we went out and gave it everything we had and that is what teamwork is all about and never give up attitude," said Moore. After a delay to clean up the track and clear the other wrecked cars the race resumed with the #54 car driven by Moore in last place of the 19 car field. Meanwhile Jon Lemke was having his own problems, his car was fast but he just could not get in position to make a pass, Lemke was blocked in behind two other cars in 10th place. The rest of the feature went cautionless, Moore could keep up with the field but was still in last place, fortunately for him Dylan Warner, Nick Beaver and Adam Benzick never got their cars back on the track after the big wreck and Bryan Wrolstad couldn't keep up and eventually pulled into the pits moving Moore up to the 15th position. On the last lap Lemke tried to get by #51 Justin Neisius for 9th but came up just .144 seconds behind. Lemke finished 10th scoring 32 points, Moore finished the race with his tires rubbing and tire smoke pouring our from under the fenders, he finished the last car on the lead lap in 15th scoring 27 points. 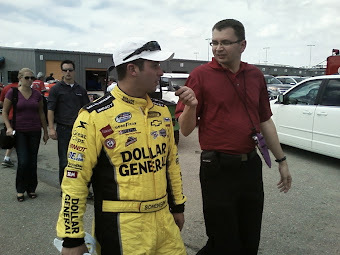 Since Moore had a 5 point lead coming into the race and there is a 1 point differential for every position between 10th and 15th place, the two drivers ended up TIED with 1061 total points for the season. The tie-breaker is number of total wins and Moore had four wins this year to Lemke having just one, so after a short delay to make sure the points were correct, Moore was declared the Champion. "It was a huge roller coaster of emotions going from getting wrecked and thinking we lost it to then winning it, it's pretty hard to explain," said Moore. This was the first ever Championship for Dylan Moore. Jon Lemke showed his true class shortly after the races posting on social media a congratulations to Dylan Moore and the #54 team. Michael Ostdiek #18 finished third and fourth in the two Hiway federal credit union Big 8 features and he ended up third place in the Elko Speedway points, only 11 behind Moore and Lemke. Ostdiek is also racing for a National title in the NASCAR Whelen All American Series Division II, he was the point leader in the entire country coming into the night. NASCAR takes a drivers TOP 14 best finishes in Division II to determine the standings so, with those two good finishes Ostdiek may have become the National Champion. We will update this story as soon as NASCAR declares the official final points. The first Big 8 feature was won by #5 Jake Sernett from Prior Lake (MN), Jake is a 16 yr old driver in his third part-time year driving a stock car. Sernett was a three time "Little Elko" Quarter Midget Champion that also traveled the country winning hundreds of races and many National titles. This was his first ever Hiway Federal Credit Union Big 8 win, Grant Brown #14 finished second, #18 Michael Ostdiek was third, #17 Jon Lemke finished fourth and #13 Bryan Wrolstad was fifth. The second feature event went to #7 Tony Brewer from Shakopee (MN) it was his second consecutive feature win after going years without a win at Elko Speedway. Brewer held off #40 Michael Beamish who has been red hot the second half of 2016, #14 Doug Brown finished third, #18 Michael Ostdiek was fourth and #2 Kyle Kirburger was fifth. The MN Corn Growers Super Late Model Championship was not as dramatic as #72 Jacob Goede from Carver (MN) won his third consecutive title at Elko Speedway. Goede was fast all night long being second quick in qualifying and scoring third and fifth place finishes in the two 30 lap main events. "It took a long time to win that first Championship but now to be three in a row it's pretty sweet and Matt (Goede) pulling off second place for the second year in a row is pretty impressive, for what we have going on to finish one and two is pretty cool" said Goede. Goede ended up finishing the points season with three wins and a winning margin of 84 points over his brother Matt #28 with Joey Miller #15 finishing third in points. Nick Panitzke #22 from Sauk Centre (MN) won his first MN Corn Growers Super Late Model feature of 2016 at Elko Speedway. Panitzke is a former TUNDRA Series Champion, he won the first of two features by 1.099 seconds over #3 Chris Marek with #72 Jacob Goede finishing third, #28 Matt Goede getting fourth and #41 Donny Reuvers a 9 time Elko Champion finishing fifth. 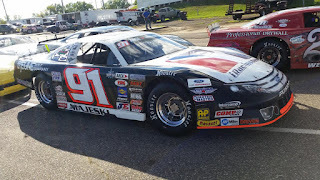 The second 30 lap feature went to #91 Ty Majeski from Seymour (WI), he battled #62 John Heath for a few laps before taking the lead after a restart on lap eight. Majeski then shot to a big lead and won by 3.599 seconds. Heath finished second, Matt Goede third, #77 former Midwest Tour Champion Jonathan Eilen fourth and #72 Jacob Goede fifth. Majeski did what he could to secure enough points to win the NASCAR Whelen All American Series Division I National Hometracks Championship, NASCAR takes a drivers TOP 18 finishes in the Super Late Model division to crown a Champion and coming into the night Majeski was in third place Nationally. 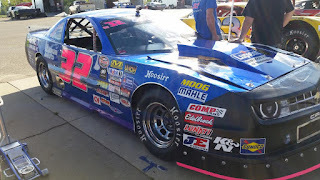 Twenty five of the top Super Late Models in the entire country raced at Elko on Saturday night. The star studded field included #91 Ty Majeski, two time defending ARCA Midwest tour Champion and winner of the Kulwicki Driver Development Program last year who is currently signed with Roush-Fenway racing on a developmental deal. Austin Nason #14 from Roscoe (IL) was the fastest in qualifying, #35 Travis Dassow came from West Bend (WI), #23 Chris Weinkauff from Merrill (WI) who a State Park Speedway Champion, #77 Jonathan Eilen who was a Thunder Car Champion at Elko Speedway and former Midwest tour Champion, #41 Donny Reuvers a nine time Elko Champion and #44 Justin Mondeik from Gleeson (WI) who was "Rookie of the Year" at three different race tracks in 2016. These drivers and many others will return to race the Thunderstruck93 ARCA Midwest Tour even next Saturday September 24th at Elko Speedway. On track Autograph session begins at 3pm with action on track beginning at 4pm. The first Genz-Ryan Thunder Car 20 lap event was won by #3 Conrad Jorgenson from Lakeville (MN) it was his sixth win of the season at Elko Speedway. Jorgenson squeezed past #8 Ted Ruevers on the low side to take the lead at the half way point of the race and then he held Reuvers off by 1.802 seconds for the win. Reuvers finished second with #18 Tina Davis coming across third, point leader #32 Jeremy Wolff was fourth and #07 Dillon Sellner finished fifth. 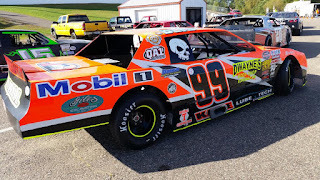 The second Genz-Ryan Thunder Car feature was won by #99 Brent Kane from Lonsdale (MN), Kane is a four time Champion at Elko Speedway and is currently second in the point standings. This was the first win of the season for Kane, he won this caution free race by a full straight-away and a margin of 3.918 seconds over #25 Eric Campbell, Dillon Sellner was third, Jeremy Wolff fourth and Ted Reuvers finished fifth. Jeremy Wolff now holds a 31 point lead over Brent Kane going into the final night of racing in the Thunder Car division next Saturday night during the Thunderstruck93 race event. It was a very dramatic win for #56 Paul Hamilton from Hastings (MN) in the first of two Pepsi Power Stock features. Hamilton followed closely behind #3 Ryan Varner the entire 20 lap race until the final set of corners, Hamilton and Varner had some contact on the last lap and then had a drag race down the front stretch. Hamilton had the better drag car and won by .003 seconds at the finish line, it was the third win of the season for Hamilton. Varner finished second, Taylor Goldman #8 was third, #37 Bryce Blohm fourth and #6 Joey Prusak finished fifth of the 18 cars that finished. The second feature saw former Champion #88 Nick Oxborough from Savage (MN) win his first trophy of 2016 in the Pepsi Power Stock division. Oxborough had to fight back the many challenges of #54 Tim Hollen for the win by only .355 seconds, #62 Tom Doten the current point leader was third followed by Bryce Blohm and Ryan Varner. Championship contender Brandon Petersen #7 had nothing but back luck, with mechanical problems prerace taking out his primary car and then a wreck in a borrowed car in the second feature causing him to finish dead last. The point standings are incredibly close coming into the final night of racing in the Pepsi Power Stock division next Saturday during the Thunderstruck93 event. Tom Doten #62 leads Bryce Blohm #37 by only 6 points. The Great North Legends feature event was once again a very exciting affair. Brady Fox-Rhode #4 took the early lead. Tim Brockhouse, the national INEX point leader in the Masters division, was involved in a wreck on lap three and could not continue. The race was then between Fox-Rhode and #71 Derek Lemke, those two drivers swapped the lead and were side by side and seemingly on the brink of disaster every lap. Finally with four laps to go Lemke made the pass on the inside coming out of corner four and he held on by .450 seconds for the win. Some of the most intense racing we have seen at Elko Speedway in quite some time, it was the sixth win of the season for Lemke. Fox-Rhode was second, #3 Dirk Henry third, #16 Matt Allen fourth and #7 Jackson Lewis fifth out of the large 21 car field. With the win Lemke has a huge 82 point lead in the standings as he is looking for his third straight Championship at Elko Speedway. Alex Vincent #36 from Owatonna (MN) won his third Hornets feature of 2016 at Elko Speedway. Vincent took the early lead and then watched in his mirror as #36 Brandon Olson and #7 Ridge Oien raced each other for the runner up position. Olson ended up edging Oien by only .027 for second place, #14 Justin Schelitzche fourth and #55 Brandon Plekkenpol finished fifth of the 12 cars competing. 13 cars raced in the Bandolero division, #3 Luke Allen from Chanhassen (MN) won again with #48 Lennon Watkins finishing second, Allen is the current point leader at Elko Speedway. Justin Schelitzche now has a 28 point lead over Brandon Olson in the Championship standings, the Hornets, Bando's and Great North Legends all end their points season on October 1st during the final Eve of Destruction at Elko Speedway. Up next at Elko Speedway the the Thunderstruck93 event in honor of Dan Ryan in support of the fight to cure ALS. It is Saturday September 24th, spectator gates open at 3pm and an on-track autograph session will occur until action begins at 4pm. Racing includes a 125 ARCA Midwest tour feature, 58 lap Big 8 Late Model feature, Thunder Car and Power Stock Championships plus Great North Legends and Hornets. Get more information at ElkoSpeedway.com or follow Elko Speedway on social media or the free Elko Racing App. Elko Speedway is located 30 minutes South of Downtown Minneapolis just off of I-35 and County road 2 in Elko (MN). The first of three Season Championship nights is coming up on Saturday September 17th as the MN Corn Growers Super Late Models and the Hiway Federal Credit Union Big 8 divisions will both crown a Champion at Elko Speedway. The premier Super Late Model division comes down to two heavyweight contenders with similar resumes. 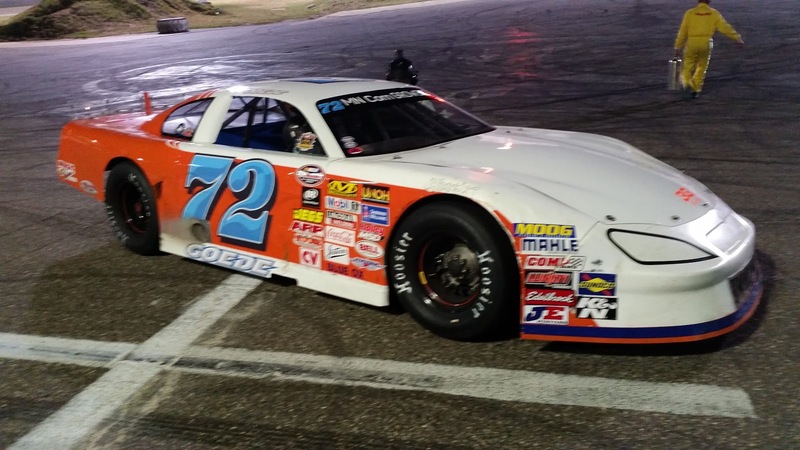 Jacob Goede #72 from Carver (MN) is the two time defending Champion at Elko that returned to his home track after years racing the Regional Touring Series circuit. 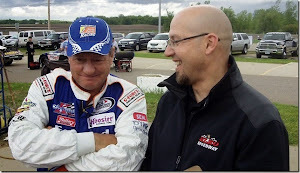 Goede has won some very impressive races over the years, including an ASA Late Model event at both Iowa Speedway and Bristol Motor Speedway in 2007. He also was the Midwest Tour "Rookie of the Year" in 2009 and won races at I-94 Raceway and Illiana while racing the Midwest Tour. 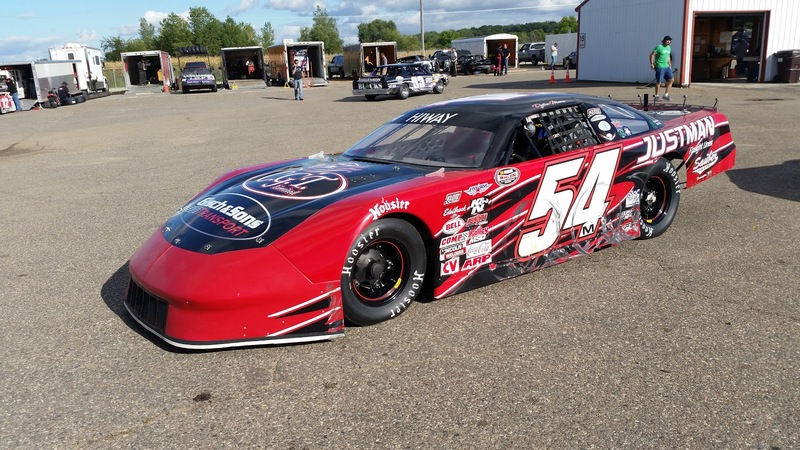 He also has won the most prestigious events at Elko Speedway as well, claiming an overall victory in the Dwain Behrens memorial this year and in 2014. 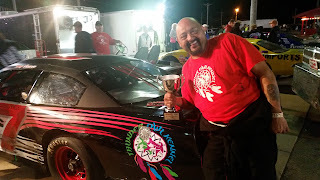 He also won the Thunderstruck93 inaugural race in honor of Dan Ryan in 2009. 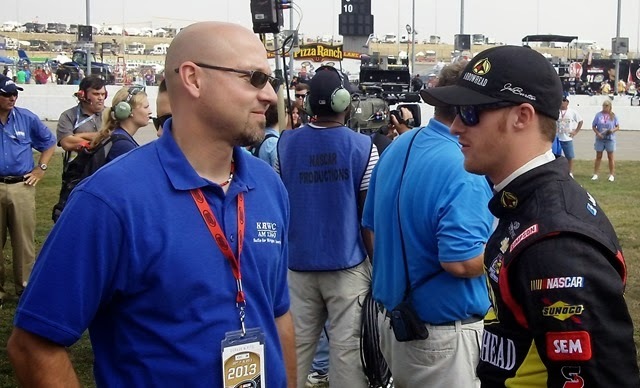 Jacob returned home to race at Elko and has dominated the Super Late Model division, winning the Championship and scoring wins in the double digits the previous two years. 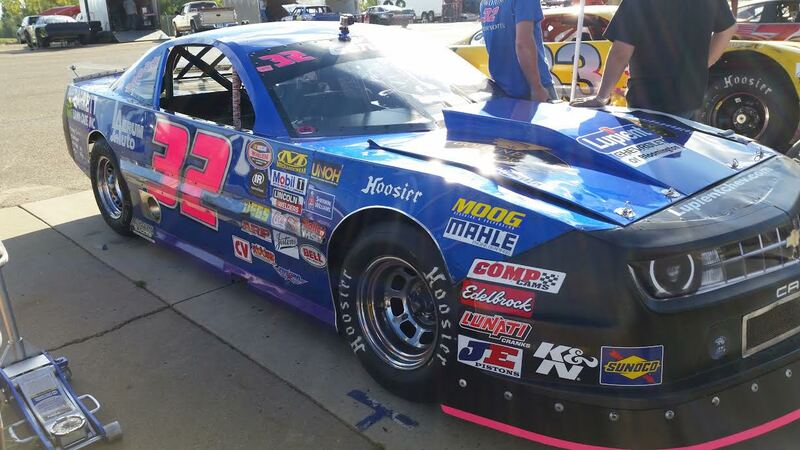 This year has been a little different, he has the point lead, but has scored only three wins at Elko Speedway. Joey Miller #15 from Lakeville (MN) is looking to take the crown from Goede. Ten years ago Miller was a rising young star in racing, he raced the National ASA Tour and then scored five wins in the ARCA series before making his way all the way up to the NASCAR Craftsman Truck Series and racing for Darrel Waltrip. He scored at Top 5 finish in Mansfield OH in 2006. Since that time Miller has taken some time off from racing and done just a part-time schedule but just this year he returned to his home track at Elko Speedway in hopes of winning a title. 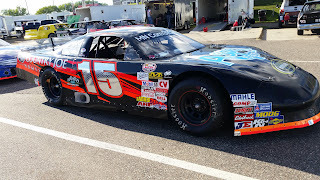 In his first year back racing full-time Miller hasn't missed a beat, he has scored five wins and is in contention coming into the final night of racing in the NASCAR Whelen All American Series season at Elko Speedway. Here is the situation- Goede has a 65 point lead. Both drivers will qualify with an opportunity to score 15 points for winning "Fast Time"
second will get 14, third will get 13 points and so on until fifteenth gets 1 point. They will race Two 30 lap Feature Events. The winner can score 51 points, second 48pts, Third 46pts, Fourth 44pts, Fifth 42pts, Sixth 40pts, Seventh 38pts, Eighth 36pts, Ninth 34pts, Tenth 32pts, Eleventh 31pts, Twelfth 30pts, Thirteenth 29, Fourteenth 28, Fifteenth 27, Sixteenth 26, Seventeenth 25 and Eighteenth and below all scoring 24 points. Which means Miller potentially could gain 15 points on qualifying and if both cars start both features that is a maximum of 27 points gained per feature. If he wins Miller has the potential to gain a total of 69 points on Goede plus Miller has the tie-breaker of most wins (5 to 3). Goede will look to take the pressure off by laying down a fast lap in qualifying and then finishing the first feature. Goede would like to have at least a 28 point lead going into that second feature so just by taking the green flag he would have his third consecutive Championship sewn up. Another factor on Championship night at Elko Speedway is that #91 Ty Majeski from Seymore (WI) is expected to attend. Majeski is racing for the NASCAR Hometracks Division I National Championship, coming into the weekend he is only a handful of points out of the lead and if he scores one or more wins at Elko Speedway he could add National NASCAR Champion to his already stacked racing credentials. This will be the final night of racing in the NASCAR points season. Majeski is the two time defending ARCA Midwest tour Champion, overall winner of the Kulwicki Driver Development Program award and was recently signed to a development deal by Roush-Fenway racing. Majeski knows Elko well, he has raced here two weekends this year, he scored a second place finish on September 3rd. He also won the Thunderstruck93 Midwest Tour race here one year ago. Race fans should expect twenty or so of the best Super Late Models in the Midwest and some great racing for the Season Championship in the MN Corn Growers Super Late Models Saturday night September 17th. The Hiway Federal Credit Union Big 8 division will also crown a Champion that night and racing as well in the Pepsi Power Stocks, Genz-Ryan Thunder Cars, Great North Legends, Hornets and Bandolero's. Gates open at 5pm and action begins at 6pm. Get more information by going to ElkoSpeedway.com, or following Elko Speedway on Social Media, or by downloading the free ELKO Racing app. Elko Speedway is located 30 minutes South of Downtown Minneapolis just off of I-35 and County Road 2 in Elko (MN). The Hiway federal credit union Big 8 Championship will be decided on Saturday night at Elko Speedway. The racing is sure to be intense with three different drivers in the spotlight not only locally but also on a National stage. The point leader is Dylan Moore #54 from Northfield (MN) who is looking for his first ever Big 8 Championship but he is accustomed to being up front in 2016, he has topped the point standings for a majority of the year, Moore has scored four wins and has twelve Top 5 finishes in 22 starts. Moore has raced in the Big 8 division since 2008 and has been oh-so-close to winning a season Championship twice before, finishing second in both 2011 and 2013. Winning races is what Moore does best, he scored a division best "most wins" in both 2009 and 2011. Dylan also can step up when the pressure is on, he won the Big 8 Late Model series invitational event during Thunderstruck93 in 2012. Dylan Moore has an 11 point advantage coming into Saturday night. Jon Lemke #17 from Shakopee (MN) is a respected long time racer with incredible credentials, he is currently second in points. Lemke already has two Late Model Championships at Elko Speedway, in 1991 and in 2004, he also spent some time racing the regional touring series circuit. 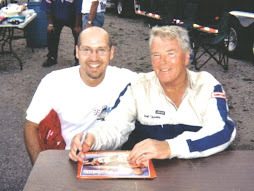 Lemke won two races in the NASCAR Midwest Series at Pikes Peak (CO) in 2001 and at Gateway (MO) in 2002. Lemke has come close to winning a Big 8 Championship in the past as well, he finished runner up to Chris Marek in 2014. Jon Lemke has had a great season at Elko, just like Dylan Moore, he has Twelve TOP 5 finishes in 22 starts but only one win. Which might be important if it all comes down to a tie-breaker. On Saturday night at Elko Speedway the Big 8 cars will go five laps in group qualifying, with times being scored off their transponders. The fastest car will score 15 points, second fastest 14 points and so on... all the way down to 15th getting 1 point. So qualifying is very important in the point standings. The Big 8 cars then will race two separate twenty lap features. The winner of each race will get 51 points, 48pts for second, 46pts for third, 44pts for fourth, 42pts for fifth, 40pts for sixth, 38pts for seventh, 36pts for eighth, 34pts for ninth, 32pts for tenth. Then the points go down by 1 per position. Eleventh 31pts, Twelfth 30pts, Thirteenth 29pts, Fourteenth 28pts, Fifteenth 27pts, Sixteenth 26pts, Seventeenth 25pts then Eighteenth place and everyone else all gets 24pts. So the point standings can change rapidly from lap to lap on Championship night. Two incredibly deserving drivers will both be racing hard in search of their first Big 8 Championship at Elko Speedway. Another person the entire NASCAR scene will be watching is #18 Michael Ostdiek a former Great North Legends Champion from Lakeville (MN). Ostdiek missed a double feature race night early in the year but is still in contention for the Big 8 Championship at Elko, he sits only 37 points out of the lead coming into the final points night. Maybe an even bigger story is that Ostdiek is tied for the lead in the National NASCAR Whelen All American Series Hometrack point standings for Division II. 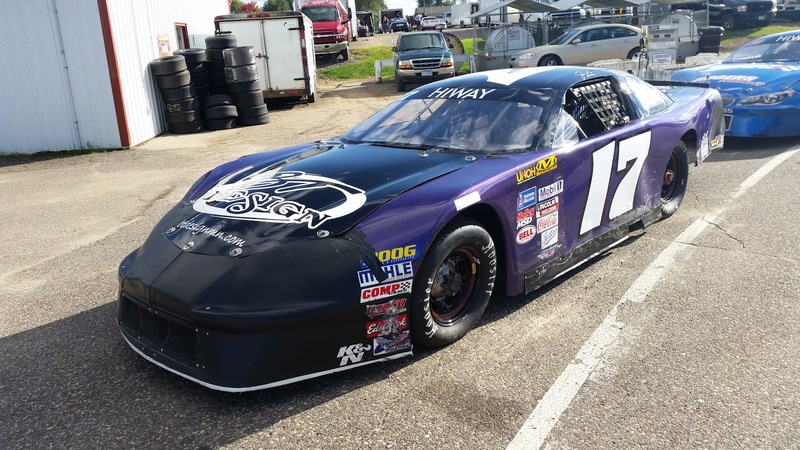 Ostdiek is a college student currently enrolled at Iowa State University, he has had an incredible 2016 season scoring 4 wins at Elko Speedway and knocking out fourteen TOP 5 finishes in only 20 races at Elko. Ostdiek is also part of the Kulwicki Driver Development program, he has traveled to many tracks in the Upper Midwest and done very well. Scoring a Fast Time in the TUNDRA series at Golden Sands and winning a BIG 8 Late Model series event at State Park Speedway. He is currently second place in the Big 8 Late Model series point standings. A NASCAR National title is in reach for both Ostdiek and Moore, if that were to happen it would be the second straight year that an Elko Speedway driver would win a National title. 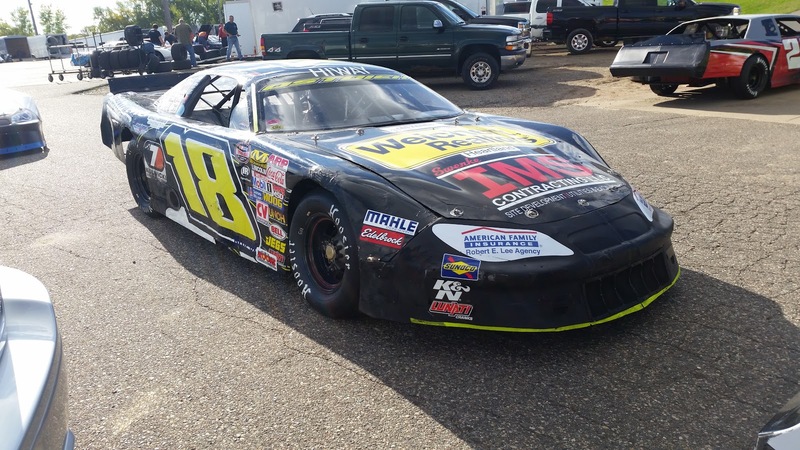 Grant Brown from Prior Lake (MN) won the NASCAR Division IV (Power Stock) Championship in 2015. The NASCAR points are slightly different than Elko Speedway local point standings. NASCAR only counts feature events (not qualifying). In order to get maximum points, you need a minimum of 18 NASCAR licensed drivers to start the feature, a driver will score 2 points for every car he/she finishes ahead of plus a 3 point bonus for winning the race or a 5 point bonus if he/she started the feature in 10th place or further back. NASCAR only takes a drivers top fourteen finishes to determine the point standings. (Top 18 finishes for Division I). Michael Ostdiek is tied for the point lead and Dylan Moore is currently tied for second only 6 points behind Ostdiek. 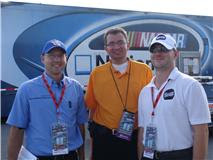 Jon Lemke is currently seventh and Joe Neisius #75 is now in ninth place in the NASCAR Hometrack point standings. The reason Elko has four drivers in the TOP 10 in points is because of the consistent high car counts every race night of NASCAR licensed drivers enabling maximum points in every feature event. Not only will a National NASCAR title be up for grabs in the Hiway federal credit union Big 8 division, but also in the MN Corn Growers Super Late Model division. 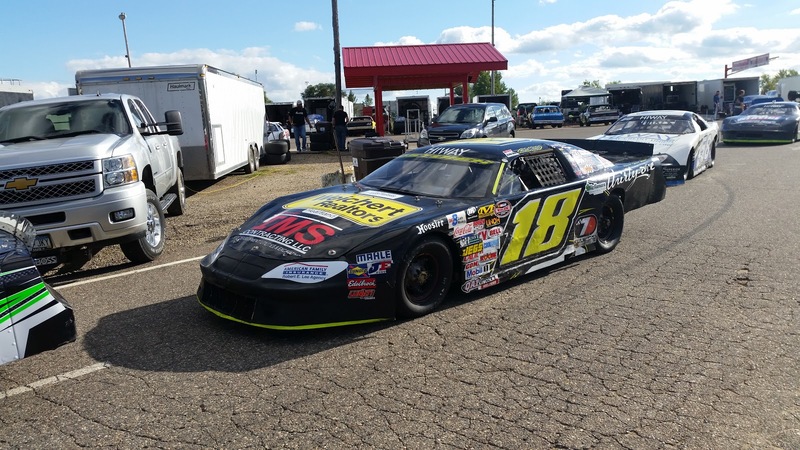 Expect to see high car counts and some extra big name drivers at Elko Speedway on Saturday night (September 17th) as drivers will want to prepare for the upcoming Thunderstruck93 ARCA Midwest tour and BIG Late Model series events on September 24th. Also racing in the Genz-Ryan Thunder car, Pepsi Power Stocks, Hornets, Great North Legends and the Bandoleros.